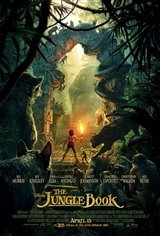 In this revamp of the classic tale, when a young boy named Mowgli (Neel Sethi) is orphaned in the jungle, he's taken in by Bagheera (Ben Kingsley) the panther, and raised by Raksha (Lupita Nyong'o), as mother wolf, alongside her cubs. Mowgli lives a peaceful life alongside the many animals of the jungle, but as he grows older, Shere Khan the tiger (Idris Elba), who hates all mankind, threatens the boy's life. It becomes increasingly clear to his friends that Mowgli should live in the "man village." Although Mowgli's journey begins with his staunch protector Bagheera, they are soon separated. Luckily, Mowgli meets a carefree bear named Baloo (Bill Murray) and gets advice from him before being kidnapped by King Louie (Christopher Walken), the King of Apes. Mowgli fights against villains such as Shere Khan and Kaa (Scarlett Johansson) the snake and ultimately decides for himself what his future will be.